I was 18 and a first-year student in college when I found out I was pregnant. I was 19 and just beginning my second year when my daughter, Olivia Isabel, was born. She and I joke that she has as many college degrees as I do, because she was there for pretty much the entire journey, from B.A. to Ph.D. Me and my Libby, on our path. This event was one of the first in an array of many (mis)/adventures my daughter and I have experienced as we’ve together navigated this academic journey, single momma with baby on the hip. And now, as my Libby closes in on eighteen, the same age I was when I found out she was on her way into my life, I find myself reflecting on our journey more and more. When you’re a single Brown teen mom, there’s no shortage of assumptions and stereotypes to face (e.g. irresponsible, promiscuous/whore, “a drain on the system”). And growing up Mexican (Chicana came for me later, during grad school to be exact) and Catholic, I served my church as a reader of scripture during Sunday mass. However, when my church leadership discovered I was pregnant, I was told I could no longer be on full display in front of the congregation with a pregnant belly and an all-too-obvious absence of a wedding ring on my finger. Disillusionment. Pain. Shame. And my first rumblings of a feminist consciousness within this painful separation from the church. And yet, not all of my memories are sad. There have been many opportunities within this academic path, some that have flown me and Libs clear across the globe, to live in London, Madrid, New York. We live in New York now, and once again, growing up Mexican, in an enormous familia, who for the most part is based in Arizona and along the West Coast, the thought that I’d uproot my daughter and move clear across the country to central New York (you mean there’s more to NY than just NYC?!) — well moving East of Texas is really only something people in my family do when they enter military service. Yet ay vamos, me and my baby girl, who at this point was ten years old and beginning 5th grade. And upon entering New York’s orbit, I quickly realized how starkly different this part of the world was from our Arizona home. We rarely, if ever, heard Spanish — and when we did hear it, it was different, Caribbean, not ours, not the same. And the same was true about the food, the culture, the lack of gente, our gente. But this was our new life, and unlike many in my family who have left home for military service, for us, me and my Libs, there is no projected end in sight — so when my familia ask, “when are you moving back?” all I can offer is a shrug. No se. I’m not deployed, I am an academic, and these jobs take us away — away from our homes, our gente, our food, our cultures. So, considering our new circumstance, I resolved to make a concerted effort to be sure my daughter maintained her roots. During winter break, our time and flights back home to Arizona are not planned around Christmas, so much as they’re targeted to get us home in time to make tamales with my mom and our Tias. In my much more developed Chicana feminist consciousness (honed and skilled over nearly two decades of learning exactly who I am through incessantly racist and sexist experiences in the academy), I have been able to model for Olivia a life lived in a woman-centric home, filled with food, song and art representing our cultura. Olivia Isabel Martinez (all pronounced en Español) knows who she is — and she’ll make sure you know too. And while I can recount many more memories within our adventurous path together in this academic life, I suppose my point in writing all of the above is that this path, this life, would not have been the same without her. As Libs prepares to start her own college path, I’m excited to see what the next chapter brings. Somos juntas. 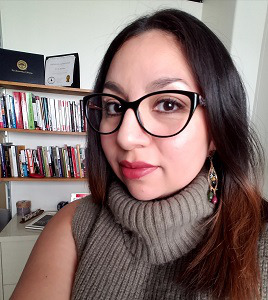 Dr. Aja Y. Martinez is an assistant professor of Writing and Rhetoric at Syracuse University. You can follow her on Twitter @ChicanainNY.